January 21, 2017 – Quito, Ecuador, High in the Andes…. 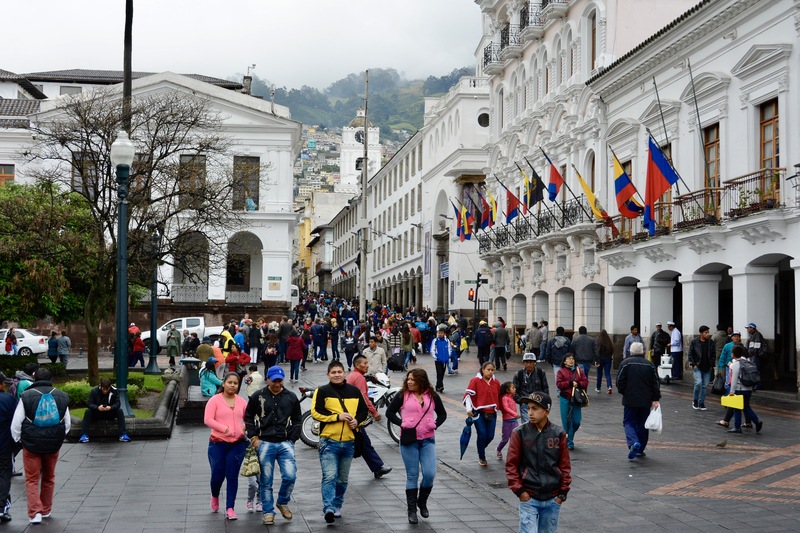 Our journey to the Galapagos first took us to Quito, Ecuador, which is nestled high in the Andes and is the highest official capital city in the world at 9,350 ft. (La Paz, Bolivia, is higher, but is not the official capital as Sucre is the constitutional capital). 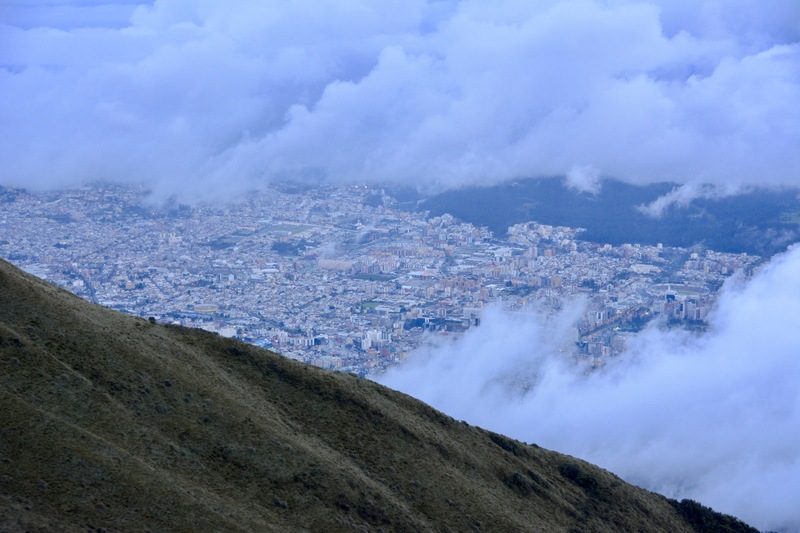 Regardless of whether it is La Paz or Quito, the city is quite high and you can certainly feel the altitude coming from sea level. We arrived around noon into the airport south of town and were immediately picked up by my brother and Diego, his co-worker here who had graciously offered to spend the weekend showing us the city. Diego is native Ecuadorian and grew up in a region several hours south of Quito, but has lived in the city for a number of years. My brother has been traveling to Quito over the last two years as his company is working with the government here in developing their oil fields. It was truly lucky that he was able to arrange a business trip here to meet us. 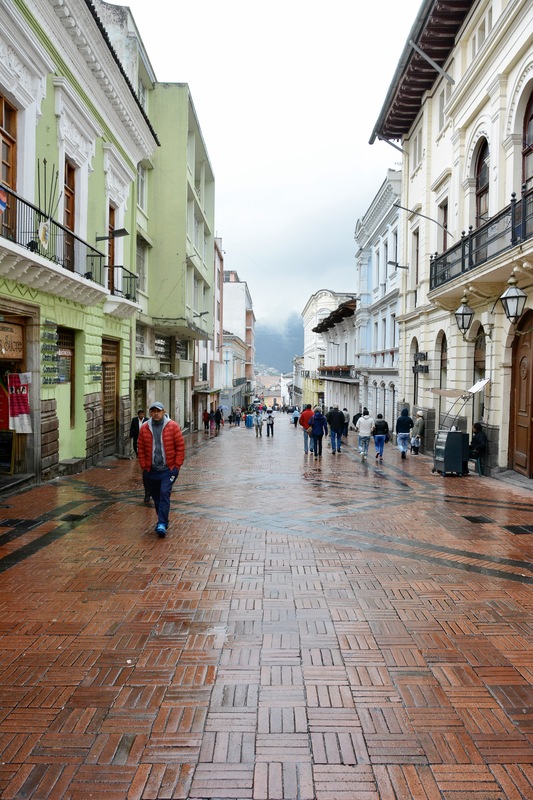 We hadn’t gotten much sleep on the flights down, but it was off to the old city of Quito as soon as we checked in at the hotel and freshened up. Quito is an amazingly old city having been founded by the Spanish in 1534, and is a Unesco World Heritage site as it is the best preserved of all the Latin American Cities despite several large earthquakes in its history. Before the Spanish built up the city in the sixteenth century, it had been the northern capital of the Inca Empire for over a century and was burned to the ground by one of the Incan generals so the Spanish couldn’t have it. The old city is centered around the town square and there are many old churches within a several block radius. We had lunch under one of the churches in a wonderful restaurant that served local dishes such as a hearty potato chowder with cheese and avocado. 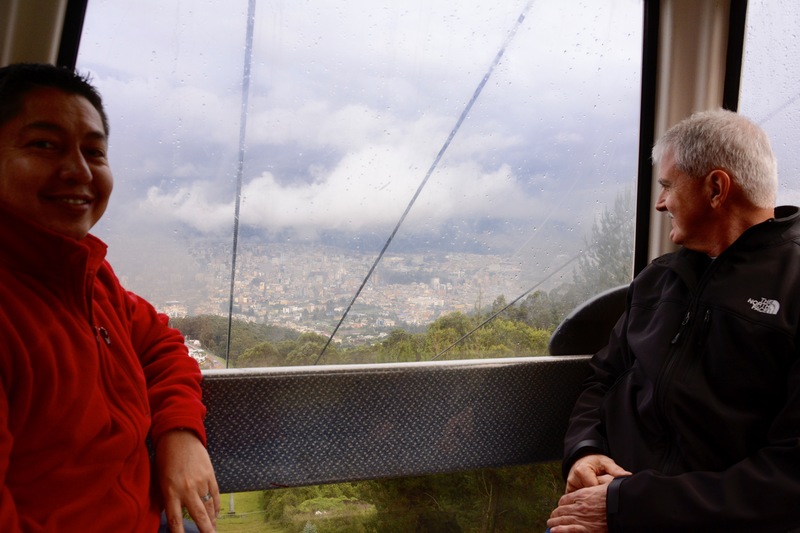 After walking through old city in a light rain, we decided to head up to TelériQo which is the tram that heads up from town on the side of Pichincha Volcano to an altitude of 4100 m (13,451 ft.) at the top of the tram. We walked around to see all of the sights, but the city was socked in the clouds as you can see from the photo. Unfortunately, Vulcan Cotopaxi, at 19,347 ft. was in the clouds as well and not visible to us. The views were still breathtaking and it will have to wait for our return to see them as we had other plans for the following day. After a trip to one of the local malls to get a sim card for my phone, Diego dropped us off at our hotel and since we had such a late lunch, we decided to relax for a few hours and head out for a late dinner. We went down the street to a local seafood restaurant where we ordered a ceviche appetizer tray for the three of us and a single mixed seafood entree that had a mix of shrimp, prawns, octopus and fish. The dishes were amazing and just the right amount of food for us. The seafood here is amazingly fresh and the ceviche is to die for! We had a nice bottle of Ecuadorian cabernet along with our dinner and by the time we got home we were all ready to hit the sack after our long travel from the States. Our first day in Quito had been incredibly full of adventure given that it was really only half a day and we still had tomorrow here to look forward to. It is in those quiet moments that we often realize that common thread we each use to weave our life’s story. Such was the case when Kathy and I sat down to explore our options for a meaningful trip to take this winter as she had a free week between semesters at her studio and I am never one to turn down the opportunity to travel. We had eventually settled on the idea of traveling to the Galapagos, a magical destination that had probably been on my bucket list, if not Kathy’s, since before I knew what a bucket list was. As I have expounded on in earlier blogs, it is the love of science, and in particular, the natural sciences, that have always directed my life. 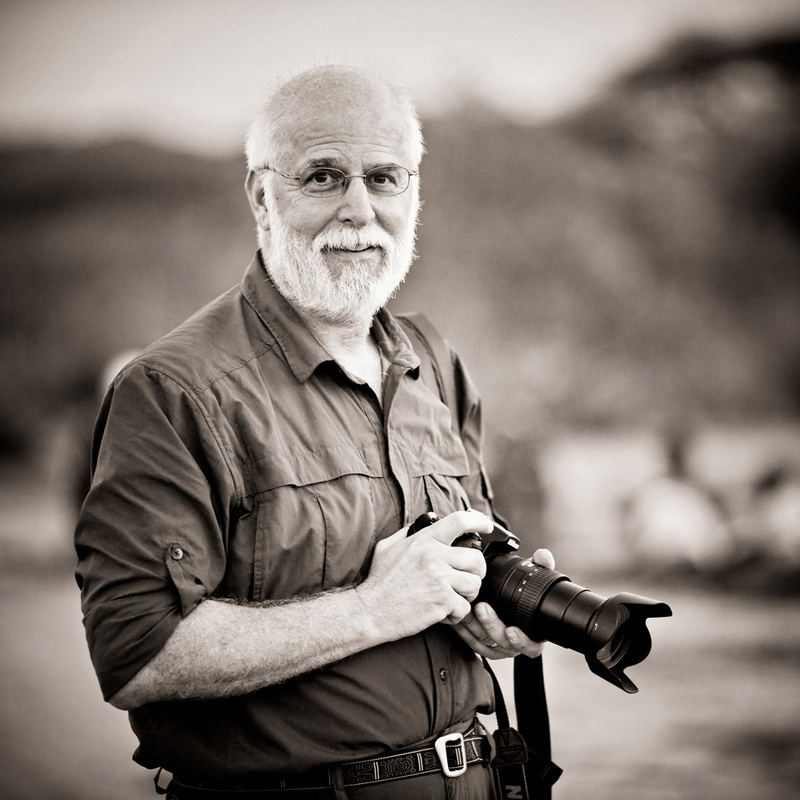 The opportunity to travel and work in Africa over the last eight years has been the realization of a dream for me and it would be difficult for anything else to even compete with what I have seen and done there. I will always consider my visits to the Great Rift Valley and Oldupai Gorge as my travels to Mecca or my quest for the Holy Grail. It has been these experiences that represent the culmination of all that I have learned, all that I have studied and all that I have known. Hence, when contemplating a destination and having Kathy offer to travel with me to the Galapagos, I jumped at the chance, though full knowing that she must have sensed some unfulfilled yearning of mine to visit this place so entrenched in the world of science and mystery. But how were we to accomplish this given the high cost of cruises to visit the various islands? Enter AirBNB and the means to find a low cost solution to staying in the islands and exploring on our own. Yes, there was still the airfare to get there and once there we’d want to take a day cruise or two, but this was still much cheaper than living aboard a ship for a week with three meals a day and lots of luxury. This was a much more viable option and would allow us to explore several islands at our own pace. So, now this brings us to how I came about sitting in the Panama City, Panama, airport at 6am on a Saturday morning pondering these thoughts and putting them to type. We’re on our way to Quito, capital of Ecuador, where we’ll spend two nights before heading to our final destination, Puerto Ayora, Santa Cruz Island in the Galapagos Archipelago. 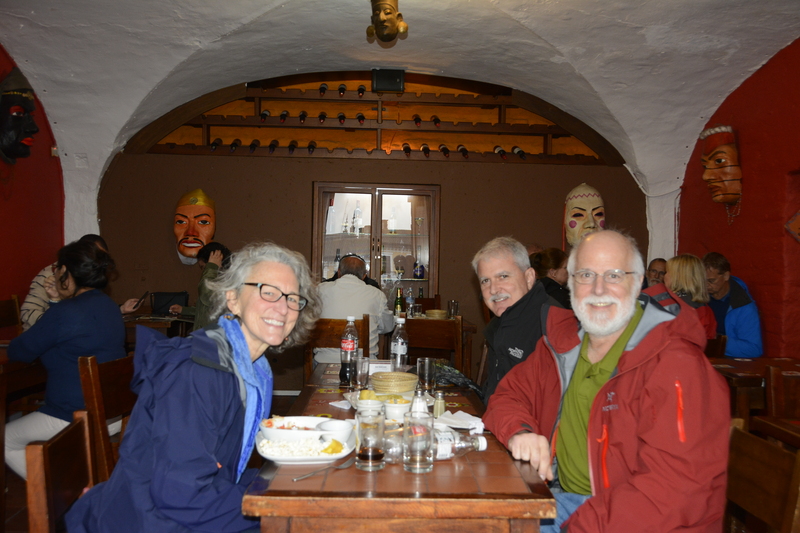 My only sibling, Jeff, is meeting us this morning in Quito as he has been traveling there for work for the last year or so and our trip just happened to coincide with one of his visits to Ecuador. 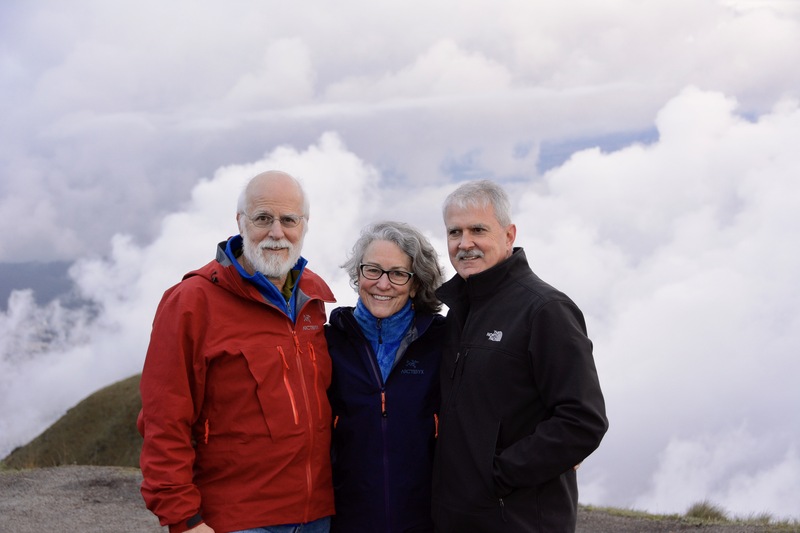 Jeff and my nephew, Nick, had accompanied me to the top of Kilimanjaro in 2015, and it is so great that I will have his company once again even if it’s not for our visit to the Islands. I’m really looking forward to exploring Quito with him over the next two days. So, it is with this introduction, that I invite you now to spend the next week exploring Ecuador with me, first in Quito, with it’s high mountains, and then in the amazing Islands of the Galapagos, with all it’s natural splendor and scientific history. This is certainly a diversion from my normal stories of our work at FAME, but I think you will find the same themes, that of exploration, growth, humanity and the natural world. Enjoy.